Taking part in BEDM doesn’t always mean following the prompts – for days when I don’t feel inspired by Elizabeth’s ideas, I am choosing to go another way. And the other way takes me into the path of another prompt, of sorts. 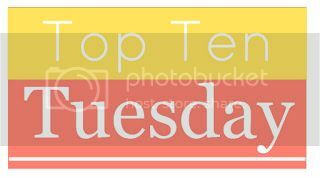 I have taken part in The Broke and the Bookish’s Top Ten Tuesday before, and that’s what I’ve chosen to do today, though I’m going with an old topic, rather than the current one! So this is about characters that you feel you would have liked to check in with, after the events of the novel. There have been countless times where I have wished for a sequel, so I could find out what happened with these characters next, so it seemed like an ideal prompt for me! OK, so really, it’s just about everyone in the Harry Potter series, but specifically, I would have liked to have known a little bit more about what happened to Draco and his parents. I find their ending really interesting, because ultimately, when faced with it, their love for each other means more than their worship of Voldemort. Did Lucius and Narcissa go to Azkaban? Draco obviously gets married and settles down, but what happens to him immediately after the battle of Hogwarts? Marianne falls deeply in love with Willoughby, but is eventually overlooked by him in favour of a rich young lady. She settles for Colonel Brandon, because he loves her, and he is reliable, and good, and she loves him in her way. But when you’ve loved someone in the way that you’ve loved Willoughby, is that life enough? I wonder if she was ever as happy with Colonel Brandon as she felt with Willoughby. Alfie and I are the same age, more or less, so I wonder where his life has taken him! He’s still a small boy in the stories, and Shirley Hughes is still drawing him that way, but if he was real, what would he be doing? This is probably a popular choice for a prompt like this, but of course, I’d like to know how Eleanor’s story continued. The book ended abruptly, and although you are led to believe that things happened the way everyone wanted them to, it would be good to go back and just make sure. There’s no doubt in my mind that Darrell Rivers is the headmistress of a boarding school somewhere. In fact, she probably became headmistress of her beloved Malory Towers. But she lived in a world where she couldn’t have a career and a family, so is that how things turned out, or did she fall in love? Another childhood favourite, sure, but don’t you wonder what Kristy, Stacey, Mary-Anne, Claudia et al are up to? Claudia was always my favourite, but the rest of the gang had such distinctive characters that it would be fun to find out what they got up to post middle school! The main reason that I would want to check in with Lisbeth Salander is simply to have a bit more Lisbeth Salander in my life. I loved this character so very much when I was reading the books, that when I finished the third one, I felt genuinely bereft. She finished the third book in a much better place than she started the first one, so hopefully she continued on the same trajectory. Of course, there’s a fourth Millennium book coming, but as it’s not written by Stieg Larsson, I can’t guarantee I’ll read it. As I write this, I find myself wondering if it would be Rachel Robinson, or if it would be Steph Hirsch, or even Alison Monceau that I’d want to check in with. Maybe it’s all three. They are, of course, the three characters from Judy Blume’s books Just as Long as We’re Together and Here’s To You Rachel Robinson. They are three interesting characters, but I always found myself slightly more drawn towards Rachel. There’s probably not really any need to check in with Leo, as the novel does that for us – we see him as a much older man, coming to terms with what happened to him at Brandham Hall in the summer of 1900. But it would be nice to find out how the events of the end of the novel changed his life again, if indeed they did. Bashkim is a young Albanian immigrant, and he is the reason that I cried while reading this book. His story is a fairly tragic one, but again, there’s so much hope at the end of the story, so I just want to check in with him and make sure that he’s happy. Who would you like to check in with? oh my goodness I would love to know what happened to the Babysitters Club girls! And all the girls from Mallory Towers. I like to think they all had happy lives and I’m sure boarding schools feature for many of them! Definitely; I’m sure they became teachers and then sent their children (if they had them) back to Malory Towers! Darrell Rivers from Malory Towers. Now that really is a trip down memory lane. I used to love those books. I have no doubt that if we were ever to check in with her, she’d be doing something very successfully. Thanks for stopping by Jo! I still re-read Malory Towers from time to time, I just love those books so much! Rachel Robinson… I reckon she either became president or had a massive nervous breakdown during her time at Harvard! AND YES TO FINDING OUT ABOUT WHAT HAPPENED TO THE BSC! I like to think that Claudia would have made it as an artist, or maybe an art therapist or something. Now I really want to write a blog post with my ‘predictions’ for what happened to them all… Do you fancy collaborating for the BEDM ‘collaborate’ day? No worries if not!